How do you choose a mattress that will be the best for your needs? 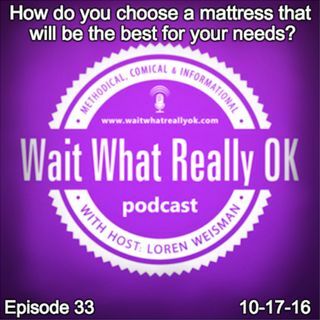 Wait What Really OK Podcast Episode 33 hosted by Brand Precision Marketing Strategist and Counselor, Loren Weisman, talks Purple, mattresses, sleep, marketing and branding with two of the marketing geniuses at Purple. The Purple brand and message is as informative and educational as it is funny. Purple is not only the company you want to buy your mattress, your pillow and your seat cushion from, it is also a company that is taking some of the best approaches in the marketing world of today that you should take note of and follow suit. Purple, its products, its team, its marketing and its model are something to be inspired by. They truly are standing out in the best ways and offering the best solutions for sleep too! How do you choose a mattress that will be the best for your needs? Ep33 of the Wait What Really OK Podcast is available on iHeartRadio or on Spreaker. Podcast Blog Supplement for Episode 33 of the Wait What Really OK Podcast with Loren Weisman. Podcast Link Supplement for Episode 33 of the Wait What Really OK Podcast with Loren Weisman. What is the best mattress for my back? Picking the right one for you. Podcast Video Supplement for Episode 33 of the Wait What Really OK Podcast with Loren Weisman. Podcast Photo Supplement for Episode 33 of the Wait What Really OK Podcast with Loren Weisman.